Ashington substitutes Dan O’Reilly and David Dormand were both on target for their side after coming off the bench at West Auckland on Saturday. But home forward Adam Burnicle denied the Colliers what would have been their first win at the WSI Stadium for eight seasons when he smashed home a stoppage time equaliser. However apart from an outstanding penalty save by ‘keeper Conor Grant shortly after half time, a pretty mundane affair only came to life 15 minutes from time when all four goals were scored. After leading twice, Burnicle’s strike was a bitter pill for Steve Harmison’s side to swallow but for the neutral, a draw was a fair result. The first period offered little other than a battle on a heavy surface with few goalmouth incidents. Indeed the first semblance of an opening came in the eighth minute following a corner on the right by Craig Ruddy but when the ball fell to Philip Caley, he blasted a volley high over. Grant fielded a shot from Burnicle before on the quarter hour, a cross from Shaun Henderson found Ben Sampson but the teenager was eventually closed down. Grant denied David Edwards then James Harmison produced a trademark block to snuff out the danger posed from the same home player. Midway through the period, a lofted ball from the back by Wayne Buchanan aimed for Ben Harmison was slightly over hit which allowed home stopper Gareth Shaw the opportunity to leave his line and claim. In the 33rd minute a long searching ball from James Harmison saw Ben Harmison glance on but Lee McAndrew snatched at the opportunity and his effort was easily held by Shaw. As half time approached, Ruddy went past two defenders and when he crossed to the far post, Henderson did well to avert the danger by heading clear. en Harmison’s shot was blocked. Four minutes into the second half, Burnicle was hauled down in the area by Buchanan and a penalty was awarded by referee Mark Ryan but Grant made a magnificent stop to save Mark Hudson’s low spot kick, diving full stretch to his left to palm the ball away. Incredibly within seconds as play switched to the other end, the Colliers had penalty claims of their own for handball turned down after Sampson had won the ball in the West box. With 64 minutes gone, boss Harmison made a double change introducing O’Reilly and Kyle Downey for Jonathan Tiffoney and McAndrew. A game which been devoid of any quality, suddenly burst into life in the closing stages and Ashington – who continually gave the ball away – ironically edged in front on 80 minutes with a well worked goal. Sampson, Paul Antony, Downey and Ben Harmison were all involved before Antony lifted the ball into the middle where O’Reilly chipped delicately over Shaw and into the net. 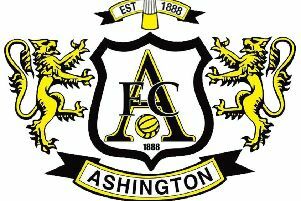 But Ashington’s achilles heel this season has been conceding quickly after scoring – and it came back to haunt them at the double. Darren Richardson drilled in a sizzling effort which left Grant rooted to the spot. Then in the 89th minute, Sampson – on the eve of his 18th birthday - sent a precision cross to the far post which was nodded back into the middle by James Harmison for Dormand to head over the line. Within 60 seconds, it could have been 3-1. Ben Harmison moved down the left wing and when he crossed, O’Reilly’s header was clutched by Shaw. But in the second of five minutes added on for stoppages, the home side drew level with Burnicle having the final say as he latched onto a ball played in from the right to lash wide of Grant. On Saturday, Ashington are at home to Chester le Street (3pm) then the Colliers make the short trip to face current league leaders North Shields on Wednesday, December 14. Ashington: Grant, Henderson, Tiffoney (O’Reilly 64 minutes), Antony, J Harmison, Buchanan, Sampson, Christensen, Bulford (Dormand 83 minutes), B Harmison, McAndrew (Downey 64 minutes). Subs not used: R Bell, Hall (gk).